মেঠোনৰ মতা আৰু মাইকী উভয়ৰে শিং থাকে৷ শিংযোৰ মূৰৰ দুয়োকাষে বাঢ়ি ওপৰলৈ ঘোৰ খোৱা হয়৷ শিঙৰ মাজত উত্তল অংশ এটা থাকে৷ শিঙৰ বৰণ শেঁতা সেউজীয়া বা হালধীয়া আৰু জোঙা অংশটো ক'লা হয়৷ শিঙৰ গড় দৈৰ্ঘ্য প্ৰায় ৬০-১১৫ ছে:মি: পৰ্যন্ত হয়৷. ↑ 1.0 1.1 1.2 1.3 1.4 Duckworth, J.W., Steinmetz, R., Timmins, R.J., Pattanavibool, A., Than Zaw, Do Tuoc, Hedges, S. (2008). "Bos gaurus". IUCN Red List of Threatened Species. 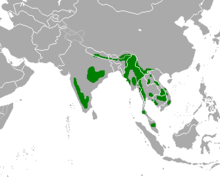 Version 2012.2. International Union for Conservation of Nature. http://www.iucnredlist.org/apps/redlist/details/2891. ↑ 2.0 2.1 2.2 Lydekker, R. (1888–1890). The new natural history Volume 2. Printed by order of the Trustees of the British Museum (Natural History), London. ↑ Sanderson, G. P. (1907). "XVIII, XVIV". Thirteen Years Among the Wild Beasts of India: Their Haunts and Habits from Personal Observation (6th সম্পাদনা). প্ৰকাশক Edinburgh: John Grant. পৃষ্ঠা. 243–265. http://archive.org/stream/thirteenyearsamo029922mbp#page/n273/mode/2up. ↑ 6.0 6.1 Choudhury, A. (2002). 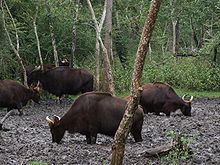 Distribution and conservation of the Gaur Bos gaurus in the Indian Subcontinent. Mammal Review 32: 199–226. ↑ 9.0 9.1 Burton, R. (2002). International Wildlife Encyclopedia (3 সম্পাদনা). Marshall Cavendish. পৃষ্ঠা. 936–938. ISBN 978-0-7614-7266-7. http://books.google.com/books?id=P0_AD0v7vl0C&lpg=PA937&pg=PA937#v=onepage&q&f=false. ↑ Huffman, B. (2004). "Bos frontalis – Gaur". ultimateungulate.com. http://www.ultimateungulate.com/Artiodactyla/Bos_frontalis.html.